The National Universities Commission has recognized the establishment of the Bayelsa Medical University, Yenagoa. The Executive Secretary of the NUC, Prof. Abubakar Rasheed, issued the letter of recognition of the varsity to a high-powered delegation led by the State Governor, the Honourable Henry Seriake Dickson, at the commission’s headquarters in Abuja on Thursday. The Governors delegation comprised the Senator representing the Bayelsa West Senatorial District, Senator Foster Ogola, the Commissioner for Education, Hon. Jonathan Obuebite, the Vice Chancellor òf the Niger Delta University, Prof. Samuel Edonmiekumor, Bayelsa Medical University, Ebitimitula Etebu, the Coordinator Niger Delta University, Mr. Bennaiah Oye, the Acting Registrar, Dr. Akpoebi Adesi. A statement by the Special Adviser, Media Relations to the Governor òf Bayelsa State, Fidelis Soriwei, quoted Prof. Rasheed as having said that the NUC had recognized the Bayelsa Medical University as the 48th State owned university, the forth medical university, and the second state owned medical university in Nigeria. 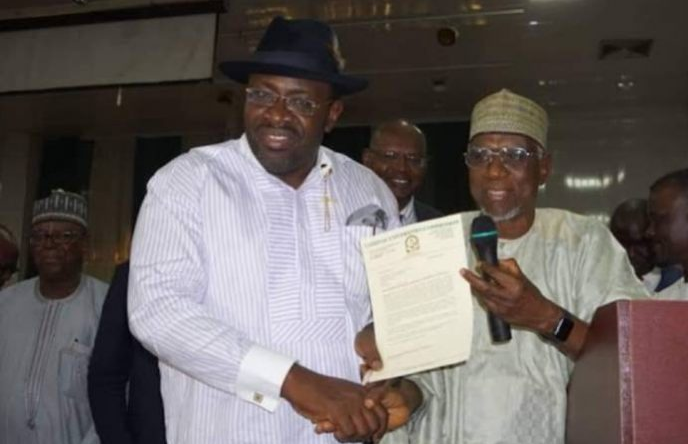 The NUC’s Executive Secretary said that while the commission was opposed to proliferation of universities, the outstanding and consistent contributions of Governor Dickson to the development of education in Bayelsa and his credibility left the commission with no other option than to recognize the school. He commended the Governor for the establishment of the University of Africa which he said has more foreign input per capita, than any other university in the country. He said that the NUC was happy that the Governor was showing the the way on how best to build a university in Nigeria. He said that with the universal character and nature of the UAT, the young institution was gradually becoming an international university which would attract a very higher raking in the global committee of universities. According to Prof Rasheed, the NUC was encouraged by the fact that ‘whatever Dickson touches, he turns to gold’ having establishing the University of Africa which had taken off on a solid foundation. He said even though the university was the fourth medical university in the country, he was optimistic that it would be a pacesetting institution in the country. “I congratulate the Governor for this feat, it is not easy to arrive at this decision. Although, we don’t encourage the proliferation of universities, we have seen the pedigreee of this great man. He has a second university that is gradually becoming an international university. Whatever he touches becomes gold. This university is the fourth medical university, but i am optimistic that it will be a pacesetter in Nigeria. “The UAT per capita has more foreign input that any other university in Nigeria. In a few years to come, that university will be ranked among the best. It has the desired universal character. Our universities are losing that universal character, they are assuming ethnic character. We have instances where communities fight over who should be Vice Chancellor òf a Federal University. “He is a good friend of the NUC, the university, a man of knowledge, with one of the best personal libraries. Dickson is a man of letters, a man of great learning. “Dickson Is one of the few Nigerians that we should be proud of. He very articulate, intelligent, Nigerian who is not inhibited by religion, tribe or zone. Speaking also, Governor Dickson that NUC for the expeditious way the request and application for the establishment of the university was attended to. He criticized the practice in the country where university education was considered cheaper than nursery and primary schools. Dickson who blamed the inadequate funding of the university system to the leadership of the country, lamented that the same people opposed to funding the university system were sending their wards to foreign universities. He said that the tendency to play politics with the universities would further aggravate and indeed kill the valued institutions. “Nigerian University cannot afford the luxury of being cheaper than nursery and primary schools. It is the fault of the leadership of the country. These are the same people who are sending their wards and and pay fees which are ten times higher. The fact is that we play politics with funding of the universities and the universities are dying. The commended said that sustained investment in education had been the priority of his administration.